Gross Area: 72,810 sq. ft.
Area Per Student: 520 sq. ft. 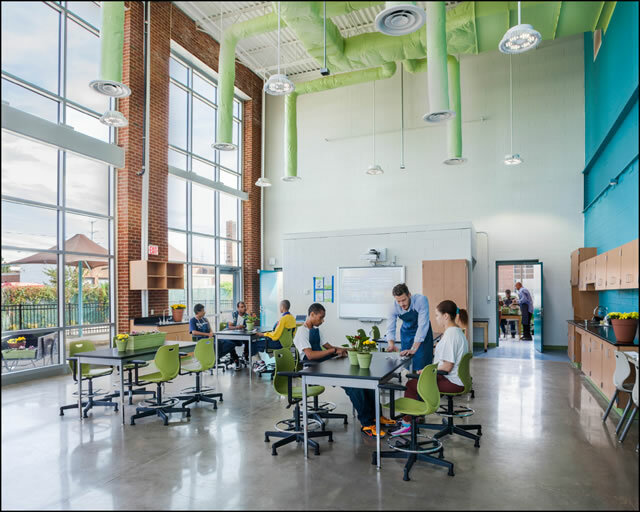 This is an example of a successful renovation that transformed an abandoned school into a learning environment that will meet the needs of each and every student. That success is largely due to the extensive planning process. 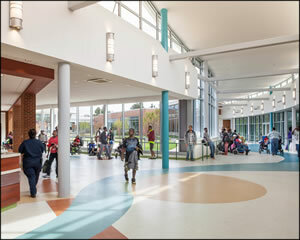 Before 2015, students with disabilities in District of Columbia Public Schools were educated in one of two facilities: Sharpe Health School for students with medical complications and mobility impairments, or Mamie D. Lee School for students with profound intellectual disabilities. 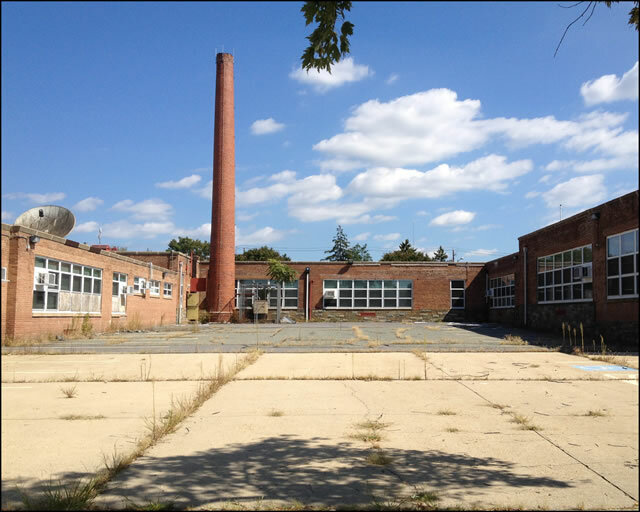 Like many special-needs facilities in the country, these schools were in desperate need of repair, and were not properly equipped to meet the needs of their students in terms of education or general care. Recognizing this, the District decided to make an investment to create one comprehensive facility, bringing together these two groups to dramatically improve their education. 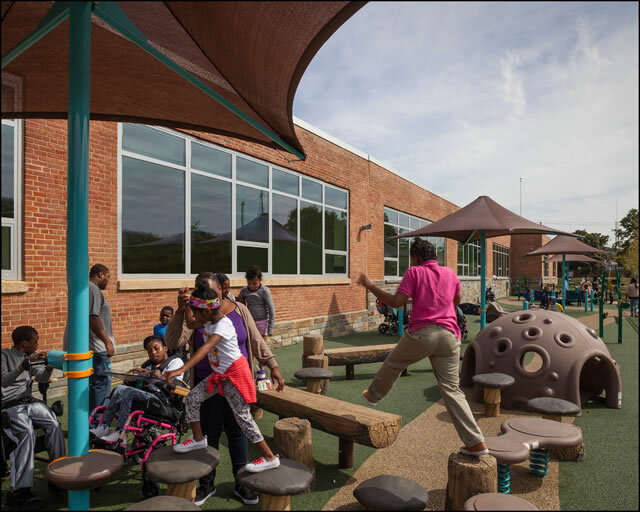 District of Columbia Public Schools set out to create a campus that seamlessly integrated the two school programs. Their goal was to improve the lives of these students and teach them valuable skills to prepare them for future careers. The District envisioned a facility where every student had exactly what he or she needed—a place where every student was properly cared for, was stimulated and was learning. They chose Bryant Mitchell Architects, in association with Fanning Howey, to design the campus and turn their dream into reality. 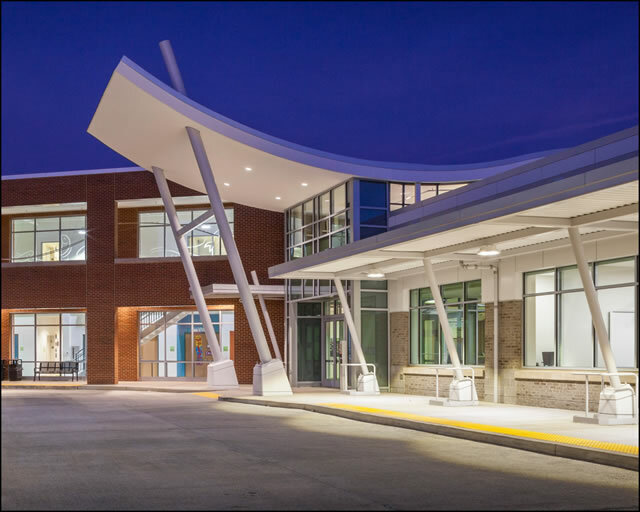 The District chose to renovate River Terrace Elementary School, a traditional school building that had been abandoned for ten years. To deliver the required program within the constricted site, Bryant Mitchell and Fanning Howey’s design repurposed an existing parking lot to create an enclosed courtyard for sensory stimulation. 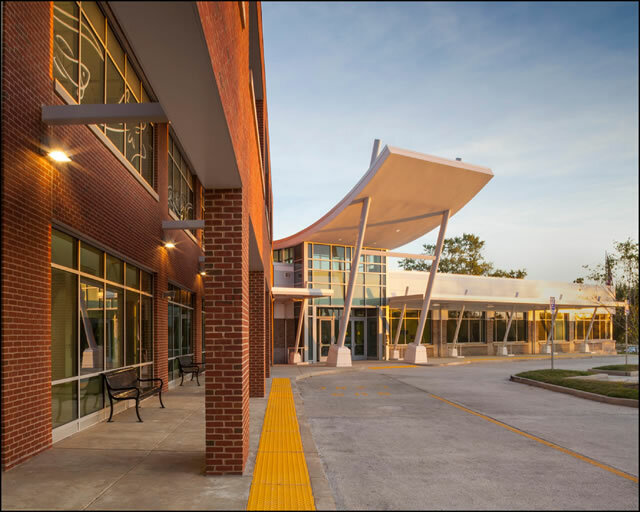 A simplified circulation pattern was chosen, organized around the large central courtyard, and multiple barrier-free strategies were used to make River Terrace an open and comfortable environment for every student. An extraordinary facility requires extraordinary planning. Extensive predesign research was conducted in the form of an educational specification document completed by the internal planning staff of the District of Columbia Public Schools, and informed by input from the District’s Division of Specialized Instruction. 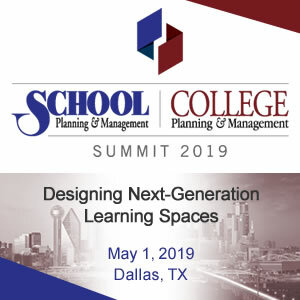 The planning process involved close collaboration with a School Improvement Team committee which included administrators, faculty and community leaders. Extensive input was also provided by the U.S. Commission of Fine Arts. This input and research led to several specific design interventions. The design captured a portion of the courtyard for use as an art room extension and an attached covered patio. The space has now become a popular venue for school activities and PTA cookouts. The need for public meeting space led to the creation of a second floor community meeting room. Ultimately, the research conducted by the District and our team, as well as the input from the Division of Specialized Instruction, informed the creation of the cutting-edge, specialized environments at River Terrace. River Terrace Education Campus is a direct result of the unique needs of the school’s students. 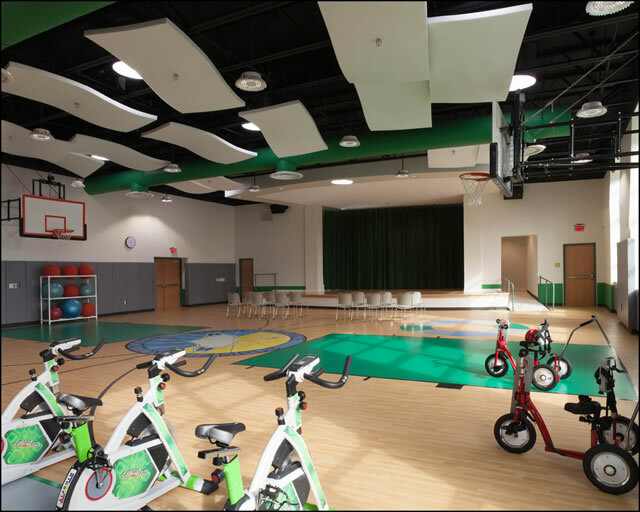 Every facet of the renovated former elementary school and new addition had to be customized to meet the physical, sensory and mobility needs of the study body. Cleaning/prep stations located at the entrance of the school prepare students for their day. Once inside, specialized interiors work to stimulate students, but don’t overwhelm them with intense colors or complex designs. Instead of traditional classrooms, River Terrace features oversized classrooms with custom furniture to accommodate wheelchairs and technologies to aid students with hearing difficulties, helping them to better understand their teachers. In addition, the campus also includes a large Workforce Development Center to teach students valuable job skills to prepare them for careers. The Center includes a Horticulture lab with an adjacent greenhouse, a Health Occupations suite and a Hospitality suite. All restrooms at River Terrace feature diapering stations and hoist systems. River Terrace features a barrier free environment with 1:20 slopes with railings, multiple hoists and accessible playground equipment for varying abilities. Instead of a traditional courtyard, the campus has an exploratory space with Pagoda Bells, Chimes and Xylophones to stimulate senses in a safe and appropriate manner. The campus features winding pathways both inside and outside of the school. These pathways allow students to take “journeys” assigned by their teachers for further stimulation and to accomplish a goal. From the beginning, our team was faced with the challenge of creating a nurturing and supportive environment for all River Terrace students, regardless of age or ability. Because the school teaches students ages 5 to 22, and students of varying abilities, the building had to feature a wide-range of accommodations and activities. 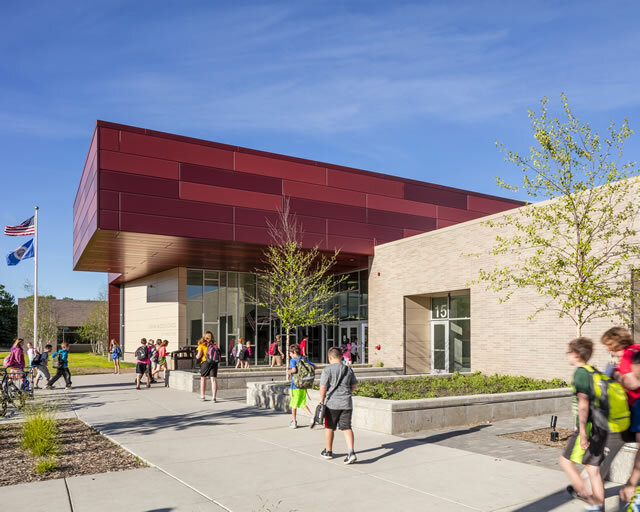 The campus also required highly-specialized design solutions to meet the needs of students in mind, body and spirit. 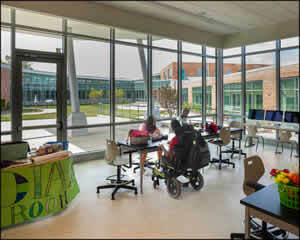 The students reclined in wheelchairs spend much of their lives looking up, so the design of the lighting and ceilings of the facilities was very important. The building features a variety of ceiling designs and stimulating lights, all of which are mild and gentle. Children with autism don’t respond well to fluorescent lights, so the entire River Terrace campus uses LED lighting. The use of glass and open spaces makes the environment of River Terrace highly transparent, so there is always something for students to look at. Accessibility was a central concern when designing for students with mobility impairments. In response, the campus was designed as a barrier-free environment. Students in wheelchairs can go everywhere—they can go in the pool, they can play on the playground—they can navigate and participate in everything the campus has to offer. River Terrace’s innovation is in its ability to meet the needs of each and every student. The campus boasts a plethora of unique features, but the two spaces that define the campus especially well are the Winter Garden and Therapy Pool. The Winter Garden is an indoor section of River Terrace’s courtyard featuring grow lights with plantings that students can see, touch and smell. The garden allows students to experience nature year-round, using all of their senses. Another memorable space is the therapy pool featuring a zero-depth entry. Some students are afraid of water, so this entrance exposes them gradually to the pool, allowing them to acclimate and enjoy it. 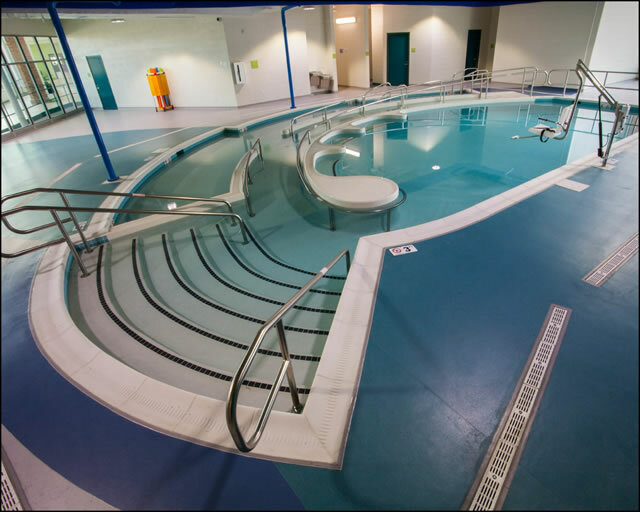 In addition, the pool also features an ADA ramp for wheelchair entry, a hoist and a chair lift, making the pool accessible and fun for all students. River Terrace uses extensive glass to create an open, transparent environment. 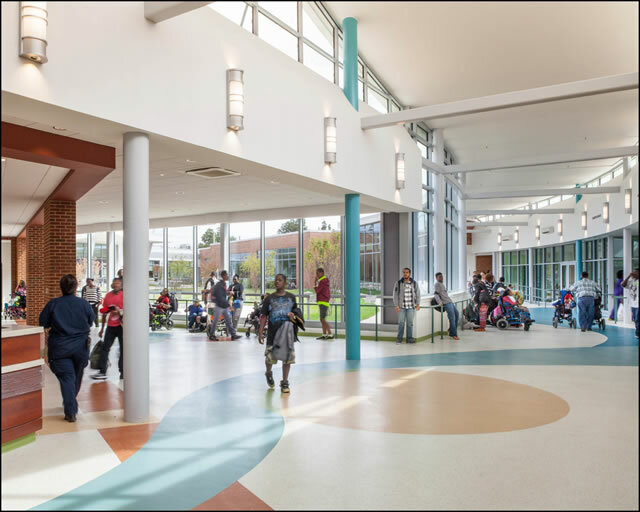 No-slip rubber flooring ensures footing for students and provides acoustical remediation. Handrails and other safety features are also used throughout. 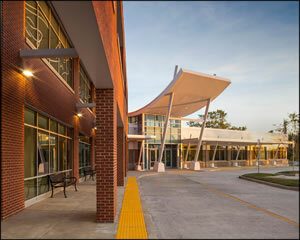 River Terrace Education Campus earned LEED Gold certification. Its use of extensive natural daylighting, light tubes and light shelves help to keep energy consumption low. The construction of its facilities also utilized enhanced commissioning, off gassing, hypoallergenic, low VOC materials. The campus contains numerous green features, many of which are physically green. The winter garden, greenhouse and native exterior gardens promote the environment and educate students on sustainability. The campus also houses on-site renewable energy resources, including a helical wind turbine that sits atop a decommissioned smokestack. Our team used almost 90% rubber tile on this project. River Terrace needed specialized materials to ensure the comfort and safety of its unique population. Flooring needed to be slip-resistant, acoustic and soft. Rubber tiling best met these requirements. Another unique flooring product used at River Terrace was slip-resistant vinyl. It was the ideal choice for the numerous student restrooms throughout campus because it is hygienic. Slip-resistant vinyl was also installed in the pool area, as it is ideal for both bare foot and shoe traffic. To keep costs low, Bryant Mitchell and Fanning Howey developed a design concept which preserved as much of the existing building as possible. This allowed the District to invest more money in the specialized learning spaces that make River Terrace so effective. LEED Gold energy savings also continue to help keep maintenance costs low. The River Terrace Education campus was a Construction Manager at Risk (CMAR) project. This required increased collaboration between the design and construction teams throughout. 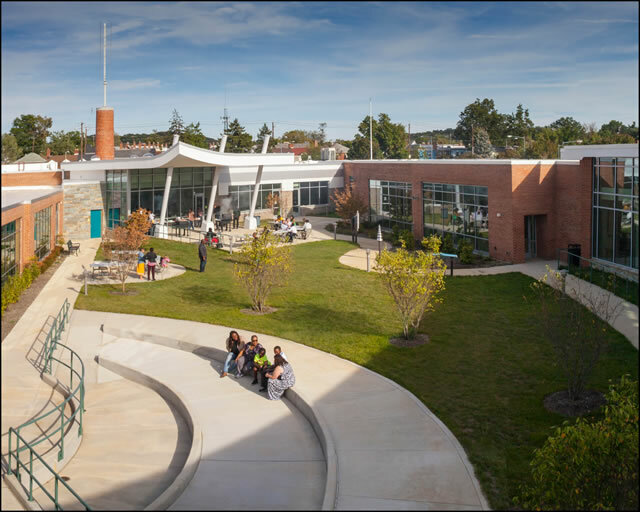 River Terrace Education Campus has established a new paradigm for District of Columbia Public Schools, a paradigm where students in need of the most help receive the best care, facilities and equipment. It is both difficult and expensive to take care of children with special needs, so having a facility they can go to every day that is specialized for their learning and comfort is significant, especially in a historically underserved community. For many of these students, their time at River Terrace will be the best of their lives. Structural Engineer: ReStl Designers, Inc.
Food Service/Kitchen Consultant: Nyikos Associates, Inc.